Sequins and leopard, just a few of my favorite things. super cute!! love those shoes. Amazing! I need a clutch like that- love the look!! That jacket is gorgeous! Love your style - I pinned your dotted look yesterday! love,love your jacket! great look. Oh my gosh, I am in love with everything about this outfit!! Wow! Hot stuff that jacket is to die for! I love this outfit. It looks simple and chic and Perfect for day or night! That jacket is freaking awesome! Omg!! Love this look!! The jacket is everything!! I love this outfit! Extremely chic. The shoes are amazing! Fabulous look! I love that your jacket blends military influence with glamorous sparkle, and your leather skinny pants and touches of leopard and perfectly edgy and trendy! Very nice outfit. Collective trends all in one getup! Save 10% on your first GLOSSYBOX! That jacket is absolutely perfect! Such a great find! I love it! I adore the glittery sleeves. So sparkly and special. You should model. You have the poses down. ohhhh lots of textures & lots of fun!!!!!!! the sleeves are amazing! the leather pants are swoon worthy! and the leopard studded heels are rocking!! Love the nail polish! What color? what an amazing jacket!! perfect! That jacket is super fab! beautiful jacket love the hair and the red lip !! Love the leggings! Did you cut your hair? @Marissa -- yes, I did! Oh my goodness!!! That jacket is stunning!!! OK, that jacket is Killing me! 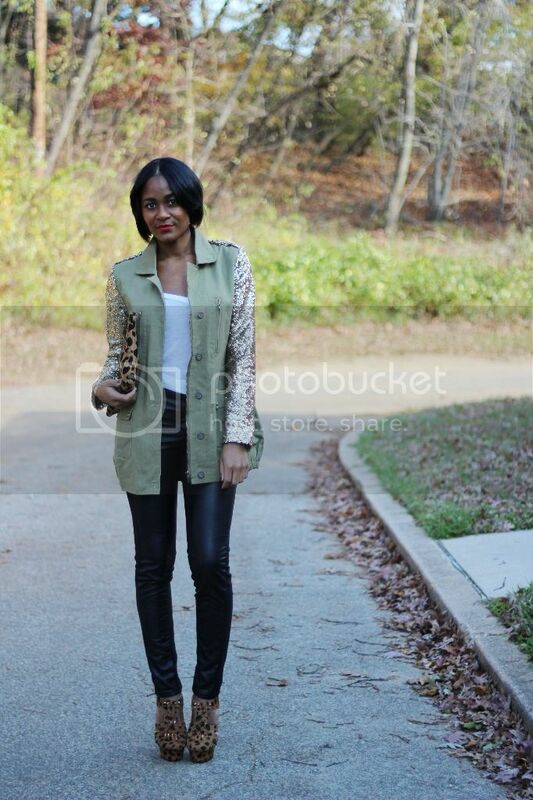 I've been wanting some sort of army green safari/glam something forever and you're wearing it! LOVING YOUR OUTFIT!!! You are Fab. Great combo! 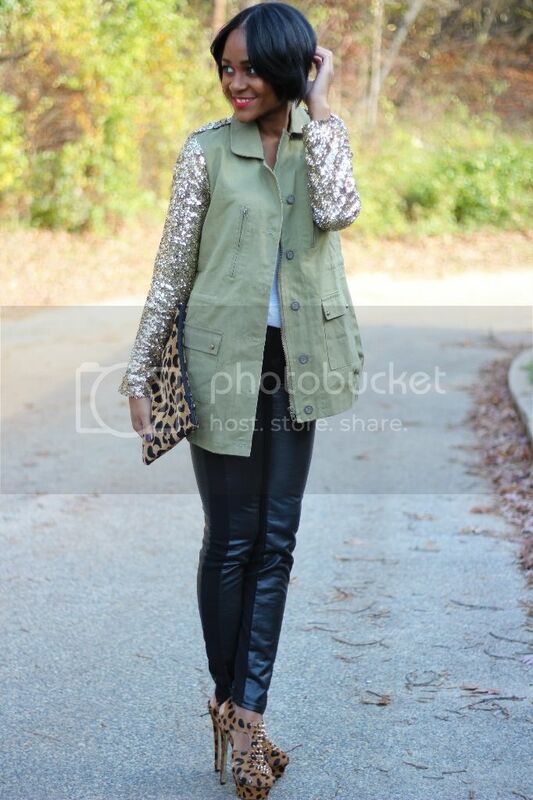 Who knew leopard and sequin looked so great together!!! Great jacket, and love the leopard print! OMG going totally crazy over this outfit! Big fat love!! The sequins, the army style, the animal print and those red lips, you rock it!! That jacket is AH-mazing! Seriously.